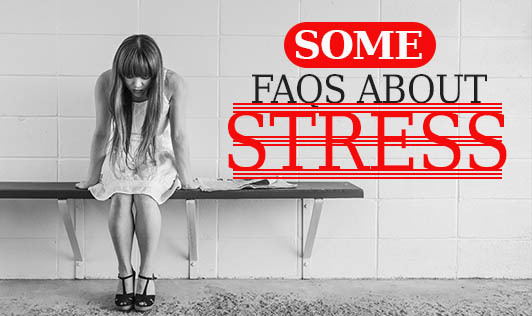 Here are some frequently asked questions about stress. Stress sets off a chain of events. First, you have a stressful situation that's usually upsetting but not harmful. The body reacts to it by releasing a hormone, adrenaline, that causes your breathing and heart rate to speed up and your blood pressure to rise. These physical reactions prepare you to deal with the situation by confronting it or by running away from it. When stress is constant (chronic), your body remains in high gear off and on for days or weeks at a time. The link between stress and heart disease is not clear. However, chronic stress that causes an increase in heart rate and blood pressure may damage the artery walls. Chronic stress does not cause high blood pressure. The exact causes of high blood pressure are unknown, but contributing factors include being overweight, eating too much sodium (salt), lack of physical activity and drinking too much alcohol. But chronic stress can take a physical toll on you. It can weaken your immune system and cause uncomfortable physical symptoms like headache and stomach problems. Medicines are helpful for many things, but usually not for stress. Some people take tranquilizers to calm them down, but it's far better to learn to manage your stress through relaxation or stress management techniques. Be careful not to confuse stress with anxiety. If you suffer from severe anxiety, speak with your doctor about whether you need medication. What is "Type A" behavior and does it cause heart disease? Since the early 1970s, doctors have used the term "Type A" personality or behavior to describe a person who is always in a hurry, impatient, often irritated, angry or hostile, and who strives for perfection. Studies found that 50 percent of men were Type A, and these men were nearly twice as likely to have heart disease as men who were not Type A. More recent studies have questioned whether all aspects of Type A behavior are equally important. These studies show that the Type A traits linked to heart disease probably are anger and hostility. Why? When you are angry or hostile, your body releases stress hormones into your blood, causing your heart rate and blood pressure to go up temporarily, and making your heart work harder. How do I know if I need a stress management class?